Welcome to another Feminist Friday! It’s that time of the year again where we all load up on hot wings, nachos and dip, and pretend to like football! Well, at least for us the most entertaining part of the annual Super Bowl telecast is watching the clever commercials, some of which end up going viral, and the half-time performance. This year’s round of Super Bowl LIII commercials have the advertising industry a buzz because of their female-focused and driven content. Dubbing it “the year of the woman”, AdAge’s Jeanine Poggi says this year’s crop of videos are by far the most female-friendly, foregoing the stereotypical objectification and instead paying attention to cultural movements that are shaping our national conversations, including #metoo and the #WomensWave. In 2018 only 13 women had starring or feature roles in Super Bowl commercials, compared to 50 men. But this year the gap is a little better: 10 female celebs are prominently featured, compared to 19 men (excluding commercials featuring NFL players). And with half the viewing audience being female, it’s a good thing we are seeing progress each year in TV advertising’s most coveted annual timeslot. 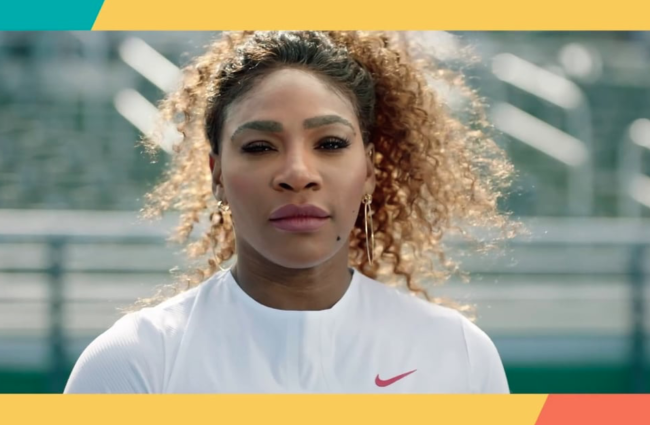 The first video that has been getting plenty of buzz around the interwebs and in feminist discussions is dating app Bumble’s video, featuring Serena Williams. Using the hashtag #InHerCourt, they are playing off the premise of the feminist dating app which requires the woman to make the first move. In a series of videos, founder Whitney Wolfe Herd talks about why they wanted Serena to star in this campaign. The advertising agency behind the video, FlyteVu Agency, said the core message of this commercial is to encourage women to make the first move in their own life, whether it be dating, career or anything else. It should also be noted that the entire creative team behind the camera was female. Check it out below! The second video we are featuring stars actress Zoe Kravitz for Michelob Ultra, who also employed a team of female creatives to create this spot for their new organic beer Pure Gold. What is cool about this is how they utilize the ASMR (Autonomous sensory meridian response) craze that Youtubers and Youtube fans are well familiar with, giving a totally fresh perspective to the stereotypical beer commercials. Azania Andrews, VP of marketing at Anheuser-Busch said it was important for them to walk the talk, especially when it came to hiring a female director as the list of leading female commercial directors is not very long. “First and foremost, as a woman in marketing, a woman in beer, with all the conversations around diversity, I feel that I want to use my power for good and I feel a responsibility to try to create equity in the industry by creating opportunities for women,” she said. Watch the ad below. The last video we’re featuring comes from Toyota (hey it wouldn’t be Super Bowl without beer and cars, right?!) who are jumping on the female empowerment bandwagon in a way that we’re happy to support. It stars Antoinette “Toni” Harris who is the first female football player who does not play a specialist position like kicker to be offered football college scholarships. Narrated by Jim Nantz, who will call Sunday’s game for CBS, the incredible story of how the 22 year-old is breaking barriers in a traditionally male-dominated arena will give you goosebumps. Toni is a sophomore defensive back at East Los Angeles College and she has been offered scholarships to continue her playing career at several colleges. No doubt her story will inspire other young girls to know what is possible even it looks like you don’t belong somewhere based on the current status quo. “It’s a perfect time in our society when women are becoming empowered as equal, more than equal, human beings. It’s a fabulous story,” said the commercial director Joe Pytka at a press briefing. Now this is a Super Bowl we can support!